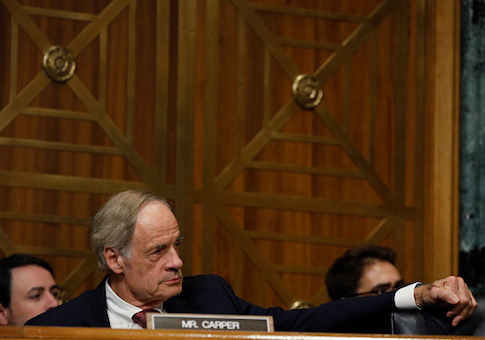 Senator Tom Carper (D., Del.) has significant stock holdings in energy companies that fall under the jurisdiction of the Environment and Public Works Committee, where he is ranking member. Carper has said he will oppose the nomination of Michael Dourson to the Environmental Protection Agency over his ties to industry, though Carper holds up to $685,000 in energy stock and received over $30,000 in campaign contributions so far this cycle from companies his committee has authority over. Dourson, who was nominated by President Donald Trump to be assistant administrator for the Office of Chemical Safety and Pollution Prevention at the EPA, is a professor in the Risk Science Center at the University of Cincinnati. He worked for the EPA for 15 years starting as a toxicologist before founding the Toxicology Excellence for Risk Assessment (TERA) nonprofit corporation. TERA, which joined the University of Cincinnati in 2015, has been the subject of attacks against Dourson because the nonprofit provided chemical risk assessments for for-profit companies. One-third of TERA's risk assessments in 2015 were for corporations, such as Coca Cola and the American Chemistry Council, but the majority were conducted on behalf of government and nonprofit groups. During a confirmation hearing before the Environment and Public Works Committee Wednesday, Carper questioned that Dourson could be an "impartial regulator," holding up a poster that described Dourson as conducting "Science for Sale." "Dr. Dourson's consistent endorsement of chemical safety standards that not only match industry's views, but are also significantly less protective than EPA and other regulators have recommended, raises serious doubts about his ability to lead those efforts," Carper said last month. "This is the first time anyone with such clear and extensive ties to the chemical industry has been picked to regulate that industry." Carper has his own ties to companies that his committee has jurisdiction over, according to his most recent financial disclosure. He and his wife own up to $100,000 in Dupont Energy stock, and up to $50,000 in stock with Icahn Enterprises, Duke Energy Corporation, Spectra Energy Corporation, General Electric, First Trust Energy Infrastructure, Dominion Resources, Inc., Marathon Petroleum Corporation, Energen Corporation, and the Chemours Company. A spokesperson for Carper said pointing out Carper's financial ties to companies that fall under his committee's jurisdiction was a distraction. "Over his 41 years of public service, Senator Carper has complied fully with all financial disclosure requirements," the spokesperson said. "Efforts to cast a shadow of impropriety over his finances is nothing more than a cheap shot and a diversionary tactic to draw attention away from the Trump administration's troublesome effort to staff the Environmental Protection Agency with people whose entire careers have focused on promoting the interests of industry over the protection of the environment and our public health." Additionally, Carper and his wife hold up to $15,000 in stock with Chevron, Halliburton, BP, Royal Dutch Petroleum Class B, Anadarko Petroleum, Transocean Ltd., TransAlta Renewables Inc., Pembina Pipeline Corporation, and ClearBridge Energy. For the 2018 election cycle, Carper has received $32,700 in campaign contributions from the energy political action committees, according to the Federal Election Commission. Carper has received contributions between $1,000 and the maximum $2,500 from the BP Corporation North America PAC, the Dominion Energy PAC, the Energy Corporation PAC, Caterpillar Inc. Employee Political Action Committee, and others. This entry was posted in Politics and tagged EPA, Tom Carper. Bookmark the permalink.